On Wednesday, May 23, senior lacrosse players attended a private graduation ceremony. 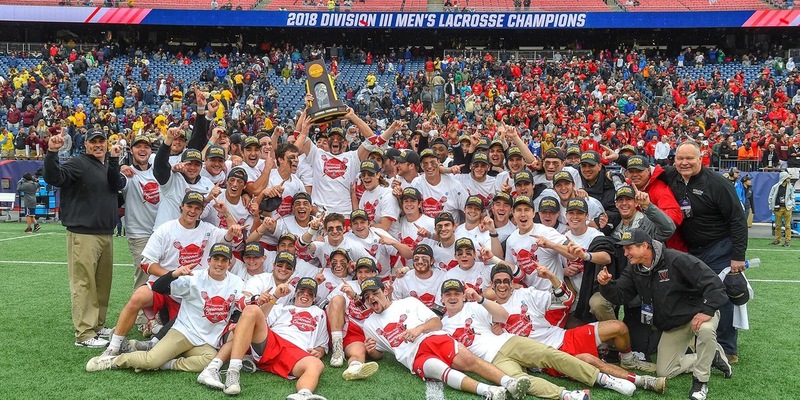 Then, as their friends walked across the stage on the following Sunday with their mortarboards, those select Cardinals were on a much bigger stage—the national lacrosse championship. The squad dethroned the two-time defending champion, Salisbury University, by a score of 8-6 to claim the program’s first-ever championship. The Birds fought valiantly to arrive at Gillette Stadium in Foxborough, Mass. But before they could take on the Salisbury Seagulls, the Cardinals had to compete against an old foe. In the NCAA semifinal, Wesleyan took on the Rochester Institute of Technology. The game took on a special significance for the Red and Black; the Tigers ended the season for the Cardinals in last year’s semifinal. Though Wesleyan’s record was not as strong as it was then, the team had a chance to right the wrongs of the previous season. It’s an understatement to say that RIT was heavily favored to beat Wesleyan. The Tigers boasted an undefeated record. They were the number-one seed in the postseason (the Cardinals were ranked ninth), and history was on their side. But this year, RIT failed to repeat their 22-9 massacre from 2017. The 2018 Cardinals wasted no time, rushing out to a 12-5 lead by half time. The Tigers raced to catch up, leading to a nail-biting finish. But ultimately, RIT came up short, losing to Wesleyan 19-18. Credit for the high-scoring win is shared by many players. Ronan Jacoby ’21 had a three piece, as did Cole Turpin ’18. But everyone — including RIT — was bested by Harry Stanton ’18, who put up six goals on only 10 shots. This was an improvement upon his performance in 2017, during which he recorded five goals. Just days later, the Cardinals carried the momentum from their unlikely victory straight into the championship game. The Birds followed their strategy from last game to give themselves a shot at winning the championship. The Cardinals raced out to a 4-0 lead over the Seagulls. At that point in the game, every shot on goal went in. Against both RIT and Salisbury, Wesleyan ran out of the starting gates, forcing their opponent to catch up. The Seagulls were likely caught off guard by the powerful Cardinal attack. Salisbury has several sharpshooters, but none could get going until the end of the first quarter. When the Seagulls began to control the ball, they ran into a powerful defense. Coach John Raba of Wesleyan ran a feisty, unrelenting zone defense for the whole game. The toughness of the Cardinals on defense thwarted the defending champions and limited their shots. When shots were taken, goalie Otto Bohan ’20 was there to stop them. He had a 64.7 percent save rate—higher than his season average. Bohan stepped up on defense making several improbable saves. One shooter on Salisbury fired from just nine feet away, and Bohan stopped it. In seven years of following lacrosse, that is the most incredible save that this writer has seen live. Stanton ends his Wesleyan career with 287 points, second in history. He also scored 224 career goals, a program record. Carter Hawthorne ’19 shattered the single-season assist record with 66. He also far surpassed the all-time assist record with 132 assists and a whole season left to run up the score. Taylor Ghesquiere ’18 ended his Wesleyan career with the tenth-most points scored in program history. Christian Barker ’19 currently sits at the twelfth spot, and he has a whole season left to climb the ranks. This championship is a great end to a historic season. But it begs the question: how will the senior-heavy Cardinals fare in the future? The program loses several All Americans and record holders. It’s reasonable to worry about the strength of the team in upcoming seasons. But rising stars like Bohan and Jacoby mixed with the remaining veterans of the group suggests that a very promising future awaits.